Although I usually discuss Adirondack animals of the wild variety, the local more domesticated version of the species are no less endearing or interesting. 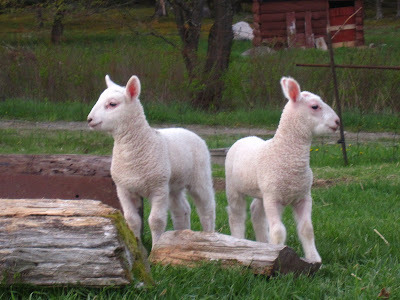 For example, the new lambs at the Gutmann Homestead in Lake Placid are absolutely adorable. It is impossible to visit them and not grin. I had the immense pleasure of doing that one evening last week. All four Gutmann ewes delivered lambs this past Spring. In total, seven lambs were born over the 13-day lambing time. That is a lot of pacing the floor waiting for the big announcement(s)! There are new triplets, a set of twins, and two single children grazing in the Gutmann grass these days. Like book ends, the twins are today’s blog stars. The Gutmann family has been raising sheep since 1988 when they took in Abby, a refugee from the Lake Placid elementary school farm. I’ve known Linda and Paul Gutmann since we moved here 22 years ago when our sons became friends in kindergarten. Over the years, I remember feeding the cosseted bottle lambs, shearing, and being the lucky recipient of luxurious sheep skin and tender leg-o-lamb gifts. Last week’s visit reminded me of the work involved in raising sheep. Although the original reason the Gutmanns started raising sheep was to avoid mowing their 3-acre yard, they now keep three pastures in the grazing rotation; the north, south, and main pastures. The multiple pastures come in handy when Mr. Chipper, the ram, gets a little rammy and has to be separated from the girls, usually in late August. He doesn’t get to visit the ewes again until late November because timing is everything and no one wants to deliver delicate baby lambs in the dead of an Adirondack winter. The gestation period for sheep is five months, and Mr. Chipper is pretty good at what he does. He first visited with girls again on November 30 last year, and the first lamb was born five months to the date later, on April 30. Linda Gutmann, the shepherdess of the family, tells me they pay strict attention and act preemptively with Mr. Chipper. Apparently, sometime in late August after the first cold snap, he starts acting up. He circles and chases the girls, with his lip curled to get a better whiff of the alluring fragrance, he hums appreciatively. Linda calls this courting procedure his “Frank Sinatra hum.” A key player in keeping the peace at the Gutmann sheep farm is Izak, the border collie/lab mix sheep herding dog. Seven-year old Izak works with Paul, the shepherd herding the flock. The best part of the whole idea for some of us is watching the flock, especially the lambs, as dusk and the “magic hour” approaches. For some reason, this is the time when the lambs are caught by the compulsion to start playing. They run in circles and spring into the air, all four feet off the ground. The best part of the springing into the air is the shimmy, or little wiggle, they manage to pull off while in the air, before sticking the landing. Clearly budding Olympic figure skaters, they have also already mastered all the prerequisite ‘Games.’ They leap over each over in bouncy versions of leapfrog and the lamb version of king of the hill. Sometimes even the moms are overtaken with silliness and get in the act with a spring or two, as if to say, “I remember being a lamb once too...I can still do this.” At the risk of being accused of silly anthropomorphism, they appear to be having a blast.